"The Permian Basin, which stretches across western Texas and the southeast corner of New Mexico, is the fastest-growing oil-producing region in the world. Output currently stands at around 3.3 million barrels per day (BPD) and has increased an astounding 800,000 BPD over the past year, which represents more than half of the worldwide production increase. That fast-paced growth, however, is about to come to a screeching halt because there is only enough pipeline capacity to move 3.6 million BPD. While the industry is building new pipelines as fast as it can, the current bottleneck could last until late next year. Because the Permian expects to slow to a crawl in the next year, it's opening the door for the Powder River Basin (PRB) of Wyoming to emerge as the industry's new growth engine. That gives producers with land in the region a leg up on the competition, which is why investors should put this area on their radar. Shale giant EOG Resources (NYSE: EOG) has been one of the leading developers of the PRB over the past few years. In May 2015, the company said that it discovered two formations in the PRB -- Turner and Parkman -- that contained high-return drilling locations. However, after increasing its return hurdle rate in 2016, only the Turner formation -- which holds an estimated 200 million barrels of oil equivalent (BOE) -- met its criteria to deliver a premium drilling return. Chesapeake Energy (NYSE: CHK) is also excited by what it sees in the PRB. The shale driller pointed out in its second-quarter report that the region was "quickly establishing itself as the growth engine of the company." That's after output in the area surged from an average of 18,000 BOE/d at the end of last year to 32,000 BOE/d by mid-July. Chesapeake expects its PRB production to reach 38,000 BOE/d by the end of this year and for it to more than double in 2019 compared to this year's average. Devon Energy (NYSE: DVN) and Anadarko Petroleum (NYSE: APC), meanwhile, have been scooping up drillable land in the Powder River Basin over the past few years. Devon Energy made a bold bet to buy acreage in the area in late 2015, spending $600 million for 253,000 net acres, which more than doubled its position. In the meantime, Anadarko Petroleum recently announced that it had invested another $100 million to lease land in the PRB, boosting its position to more than 300,000 acres. With pipeline constraints expecting to slow the Permian down over the next year, several drillers are turning their sights to the emerging Powder River Basin. Given the strong drilling results companies like EOG, Anadarko, Devon, and Chesapeake have delivered this year, it suggests the region could fuel fast-paced growth for producers that operate in the area. 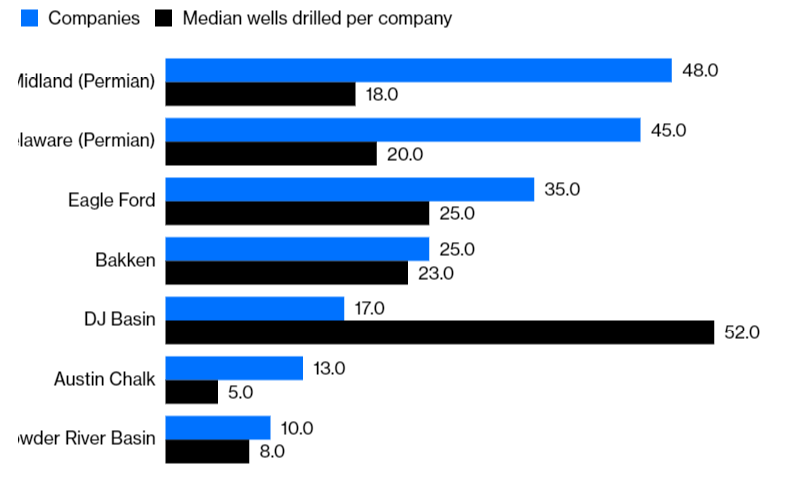 Their ability to grow at a time when many rivals can't has the potential to give them an advantage over the competition, which could then enable these oil stocks to outperform their peers in the next year." The Bureau of Land Management released an environmental study on Friday for a 5,000-well oil and gas project in Converse County. Five major players in Wyoming industry proposed the joint project, which would cover 1.5 million acres, just north of Interstate 25 between Glenrock and Douglas, and take place over a period of 10 years. Each well proposed is expected to last about 30 years, according to the environmental study. It’s a hefty undertaking in a region of Wyoming that’s already expecting another oil and gas boom if prices hold. Anadarko Resources, Chesapeake Energy, EOG Resources, SM Energy and Devon Energy are the partners on the proposal, first made in 2014, before the oil sector busted. The Bureau of Land Management anticipates the joint approach to drilling in the southern Powder River Basin will generate more than 8,000 jobs and between $18 billion and $28 billion in revenue. “(The environmental study) has been an ongoing effort for several years,” said Jennifer Brice, a spokeswoman for Anadarko. The project, and the federal study, will allow a collaborative approach to development in the region, she said. Federal, state and private interests are all impacted by the proposed project in the county. About 90 percent of the land is private or state owned. Only about 6 percent of the project’s 1,500 well pads will be built on Bureau of Land Management Land. The remainder is on the U.S Forest Service-managed Thunder Basin National Grasslands. The Bureau of Land Management owns more than 60 percent of the minerals to be tapped. The environmental study notes that the proposal calls for year-round development and exemptions to operate in sage grouse and raptor habitat. Of the 53,000 acres directly disturbed for pipelines, roads and pads, about 21,000 acres may be disturbed for the full life of the project. Converse County is no stranger to oil and gas development. Douglas was in the heart of the 2014 boom, when oil prices eclipsed $100 a barrel. Recently, local officials have signaled that increased industry activity is on the way in 2018. Companies like Anadarko have already applied for thousands of permits to drill in Converse County, stoking expectation by locals of a boom to rival 2014. Interest in Converse County has excited some of the Wyoming-based operators who are gleaning information on how to approach the multilayered Powder River Basin from other major players. Tapping the Powder River Basin north of Douglas has been front and center for the Wold Oil company since last year. The company completed a horizontal well in December north of Glenrock on a pad that can hold more than a dozen more wells, and Wold has moved on rapidly to other drilling in the region. So far, activity has had some impressive results, said Peter Wold, of Wold Oil Properties. But there are still mysteries in the Powder than can only be solved by more activity, he said in a recent interview with the Star-Tribune. Others are looking at this development with concern. Morrison’s concerns include water resources to feed this level of drilling activity, and the proper disposal of waste water, as well as air quality impacts and wildlife habitat fragmentation. One of the issues raised in the environmental study is how the project will impact sage grouse, an imperiled bird that is protected by state and federal provisions. A key habitat for the grouse is located within the project boundary. Public comment is open until March 12. The Bureau of Land Management will hold three public meetings on the project in Douglas, Casper and Glenrock. Last week, the House Natural Resources Committee held a hearing on actions the Interior Department is taking to eliminate onshore energy burdens. We’re proud that two Western Energy Alliance members were outstanding witnesses who effectively explained the obstacles to responsible leasing and development to Congress. Alliance board member Shane Schulz, QEP Resources, discussed how nonfederal lands in places like Texas, where the regulatory regime provides less risk and more certainty, are able to attract more capital than public lands. Jarred Kubat, Wold Energy Partners, discussed how delays, such as the 415-day average delay between parcel nomination and lease sale, are a deterrent to development, especially for small businesses like Wold. Thank you to Shane and Jarred for spending the time and effort to educate Congress on these public lands issues! The hearing was a first step for the Committee as it crafts legislation to address those leasing obstacles. The resulting bill will likely be a companion to the permitting bill, the SECURE American Energy Act, which the Alliance has also been actively engaged in. As you may know, Western Energy Alliance was founded in 1974 as the Independent Petroleum Association of Mountain States, designed to be a voice in Washington on federal issues that affect independents. While we lost “independent” from our name in 2010, we didn’t change our mission. Our advocacy is still focused on small independents. To that end, I’d like to kick off a new periodic feature of those independents that form the backbone of our membership. Since Jarred was just testifying on Capitol Hill, now is a good time to highlight Wold Oil. The company has been a member for many years, and we’ve enjoyed working with Jack, Peter, Court and others in this family owned and operated business founded in 1950. Jack currently serves on the Alliance’s Board of Advisors and PAC (Political Action Committee) Steering Committee. John Wold, patriarch of the Wold family, served on the very committee Jarred testified before as Wyoming’s Congressman in the late 1960s and early 70s. Congressman Wold also has the distinction of being the first geologist to serve in Congress. Wold Energy Partners (WEP) is a four-year-old entity of Wold Oil, with 37 full-time employees, focused entirely in the Powder River Basin of Wyoming. WEP operates 119 wells, is a partner in 82 additional wells, and has acreage totaling 143,000 net mineral acres (264,000 gross acres) with greater than one billion barrels of recoverable reserves. WEP is truly an entrepreneurial endeavor as the product of 192 acquisitions and trades, with 394 individual federal leases representing 71% of its PRB acreage position. I very much appreciate that the company was willing to share its experiences with federal leases before Congress. Thank you Wold Oil for your leadership on behalf of the small independent producer, and your membership in Western Energy Alliance. And thank you for kicking off our new feature! If you’d like your company to be featured, please let me know. Wold Energy Partners' new drilling project means new and returning jobs in Wyoming.